India’s defence sector could offer manufacturing opportunities worth $250 billion within the next seven years with the government seeking increased private sector investments in the area, said Amitabh Kant, secretary, Department of Industrial Policy and Promotion. “If India is going to import $140 billion in seven years and if home land security is going to need a business of another $110 billion, it means $250 billion worth of business in the next seven-eight years. How quickly we could transform ourselves into a defence manufacturing country is a key challenge to India,” Kant said, at an Assocham (Associated Chambers of Commerce and Industry of India) event here on Monday. He said that if the country is going to import $140 billion in the next seven years coupled with the fact that home land security will require a business of additional $110 billion, then opportunities worth $250 billion is expected to open up in this sector. 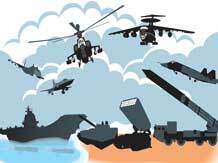 The government seems quite bullish, with the defence sector expected to boost the laggard manufacturing sector. This is also due to the fact that the limit of foreign direct investment in the defence sector was raised to 49 per cent from 26 per cent earlier. “We have opened the defence, railways, insurance and medical devices sectors. That is really opening up of the Indian economy. Other than multi-brand retail, India is the most open economy in the world. Defence is a huge area for growth in the future,” he said. On the ease of doing business initiatives undertaken by the government, Kant said the India should take the lead in improving the business environment and investors' confidence. He even said that the government is going to soon implement a mechanism wherein states will be ranked based on ease of doing business in the respective states. "We are putting a professional agency to evaluate all the states (on these parameters) and rank best and worst performing states," Kant said adding that by June- July states will be rated based on 98 parameters. As a result, he said, states will have to take adequate measures to improve their ease of doing business measures by May 31. Highlighting the fact that complex rules and regulations concerning land acquisition will have to be done away with, Kant stated, "the real action is in the states."